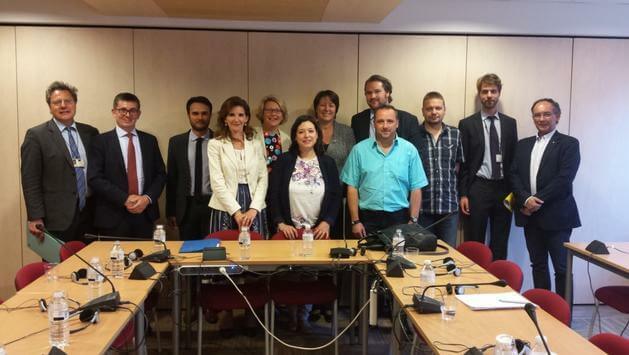 On June 16th, 2015, Commissioner for Transport Violeta Bulc met with the European Sea Ports Organisation (ESPO), the European Transport Workers Federation (ETF), the Federation of European Private Port Operators (FEPORT) and the International Dockers’ Council (IDC), to discuss the achievements, current work, priorities and expectations of the Sectoral Social dialogue Committee for ports and listen to Commissioner Bulc’s priorities regarding the port sector. In June 2013, ESPO, ETF, FEPORT and IDC established, with the support of the European Commission, the Sectoral Social Dialogue Committee for ports. In their opening statement social partners confirmed that the Committee aims at contributing to the sector competitiveness while creating and retaining good jobs. They reminded that amongst the issues under discussion in their Work Programme from 2015-2016 there are occupational health and safety issues, training and qualifications, and the promotion of female employment in the sector, although the scope of the agenda will be widened on a step by step approach to include other topics of relevance for the sector. Social partners emphasized certain challenges that the European port sector faces and that impact both its competitiveness and social dimension, such as the ever increasing size of ships; the competition from non-EU ports; the need to timely negotiate new working patterns and provide adequate training for technological innovation and minimise its social impact; the lack of adequate investments on hinterland infrastructures, which should be improved in order to cope with growing volumes, together with the removal of administrative barriers to the internal market; new energy landscapes and societal environmental pressure for the introduction of green technology; the need to ensure good working conditions and good social partnership in all ports. Social partners reiterated their commitment to further strengthen trust amongst them and to work towards an even closer cooperation with the European institutions. They will keep working on an ambitious work programme and agenda to achieve concrete results and reflect the evolution and dynamism of the port sector. Social partners also voiced their expectations. They among others expressed their wish to be consulted by the European Commission upstream of initiatives regarding the port sector. Additionally, social partners requested more support to social dialogue, both politically and in terms of resources. Cross-sectoral cooperation amongst different committees on specific subjects would be more than welcome. The four organizations renewed their appeal to give priority to social dialogue as already declared in their statement from December 2014. Commissioner Bulc said “I feel honoured to be here today. European ports are a dynamic environment and a huge source of employment in Europe. Social partners expressed today great expectations and strong commitments. I am determined to be a fair companion for them and maintain close dialogue”. ESPO in its capacity of representing Bulgarian Port Infrastructure Company, Cyprus Port Authority, Union des Ports de France, Transport Malta, NC Port Administration Constantza, Sveriges Hamnar, British Ports Association, UK Major Ports Group.